Fashion, jewelry and lifestyle. The temporary showroom set up for the 2019 Fuorisalone in via Ventura 2 in the Lambrate Design District will show a different and unexpected side of Sweden, colorful and playful, far from what is traditionally associated with Scandinavian design. The van Deurs label is a concept based on the love of fabrics and the pleating craftsmanship. With passion for up cycling and sustainable design processes, we transform carefully selected high quality fabrics and vintage scarves into pleated, unique and timeless luxury accessories. The pleating process is one of thorough craftsmanship. The machines and paper moulds used are hundreds of years old and require a lot of manual labour. The know-how of the craftsmen working with the van Deurs’s products guarantees the perfection of your unique pieces of pleated garment. Pleated fashion since 1992. Susanne Beskow / award winning founder of van Deurs, as a graduate from renowned beckman’s college of Design, Susanne received the prestigious H&M Scholarship with her graduation collection – pleated, of course. Since then, the van Deurs’s label has been true to pleat, popping up at fashion weeks and exhitions in places like Tokyo, Paris, Hong Kong and New York as well as in her home town Stockholm. The collection combines craftsmanship with international sculptural silhouettes, reinterpreted for a contemporary audience. Each garment is handmade with traditional techniques, clean lines, uniquely designed fabrics and handmade prints, to present a timeless expression of modern femininity. Each design is like a work of art. Jan Klingler is an industrial designer from Germany who currently resides in Stockholm, Sweden. In 2016, he graduated with a BFA in Industrial Design from the Faculty of Design in Hildesheim, Germany. In 2018, he received his Master’s Degree in Individual Study/Industrial Design at Konstfack University in Stockholm, Sweden. Jan enjoys finding design inspiration in the most unexpected of places. Blacteria In A New Light wants others to see bacteria as a carrier of meaning, rather than a carrier of disease. 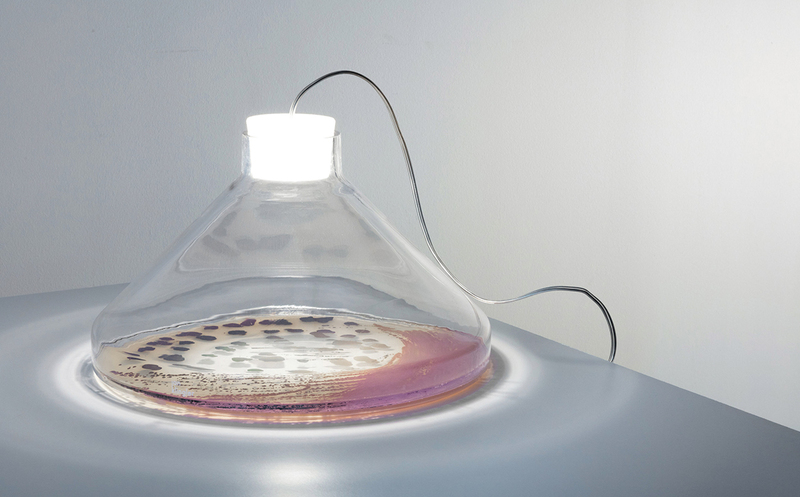 “In a New Light” lamp collection challenges us to see a new connection between the object and user by creating a visible link through bacteria, shining a light on the very thing we thought should stay hidden and putting it on display. Ingela Djupedal Design is a brand launched in January 2018 with the idea of ​​transforming works of art into prints for interior design and fashion. All prints are created from original paintings by hand. The prints are available on request, on various qualities of fabrics, from the most delicate silk to more robust fabrics for cushions, curtains and armchairs. Mi Carlsson and Martin Bergström, respectively the founder and designer of Sidenkompaniet, believe in the strength of the union between sustainability and glamor. In 2007, Mi traveled through China, the place where the mulberry silk was born, to work with expert craftsmen while together they reviewed every detail of the silk production process in order to guarantee sustainability from the beginning to the end of the supply chain. Mi, together to its partners, it has combined the ancestral knowledge of silk processing with modern Swedish designs to create a company dedicated to putting the planet and people first, without sacrificing beauty. The Kueen brand was created by Swedish designer Karoline Lenhult in 2014. Through her passion for design she creates exclusive scarves for both men and women. In addition to scarves, the Kueen collection offers pockets, kaftans and even silk cushions. The collections are inspired by Venice and Italy, designed in Sweden and produced in England. Born in Sweden, Frida has spent almost two decades on an adventure, a journey that crosses many cultures, countries and continents. In London, he discovered an insatiable passion for design. Frida’s love for the mystery, for the ancient world and for the same vital force that shows in each piece of her handmade jewels is unstoppable. “Custom-made jewelry is an extremely powerful and visible instrument of personal expression and it is very satisfying to design with innovative materials that give voice to the inner essences of the material and the wearer,” says Frida. “I want people to feel they are adorned with something that has a story”. His pieces include an ever-increasing range of materials including antique costume jewelery, semi-precious stones, rare beads, woven leather, copper, antique silver and other unique items found during his travels through dusty but charmed markets. The Swedish designer Marie‐Louise Hellgren challenges the basic rules of design–by starting at the finishing end. She is a master in bringing discarded materials into new life and good use and is a pioneer in the forefront of the Upcycling-movement in Sweden, as well as an internationally renowned designer. Winner of Swedish Elle Decoration 2017 and represented with several objects at the Swedish National Museum and has participated in international exhibitions during the Venice Biennale, at Tent London and the General Consolate in New York. She recently founded a new brand called HearteartH Production. VE & Vile is all about 3d Printed Ring. Through thios thecnology the brand can cut costs and offer lower prices as much as 70% while still producing the Jewelry in higher quality. The company prints Jewelry directly in Silver, Gold or Platinum and then has the piece finished by Sweden’s most skilled craftsmen, so that they can offer the best quality jewelry to the best possible price. “Everything we think or say about jewellery applies to our pets – dogs especially. Our dogs go where we go, see more than we see. They’re part of us, part of our family. Dogs have been part of human life for at least 12,000 years. Their connection to our lives is deep and essential.” This is what this swedish designer explain about the idea behind the brand, that creates colorful and elegant accessory for pets. Every owner is unique, and so is their dog!